Soft light is light that creates shadows with a gradual transition from light to dark. There are no hard shadow lines. It is created from a scattered or diffused light source. Soft light is found where the lighting is indirect or where it passes through a diffuser, clouds or some other medium which scatters the light. Diffused light can be light that has bounced off one or more surfaces before it hits a photographic target. 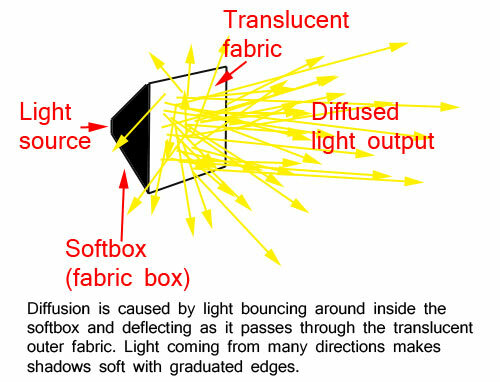 Soft light may be created by many light sources which prevents the harsh shadows created by a single hard light source. A soft light source is large (relative to the subject being lit) and/or close to the subject. transition of the shadows from light to dark. A light which is very soft has a wide transition from light to dark. The transition of light to dark gets progressively smaller as light gets harder. A softbox creates diffused, soft light.